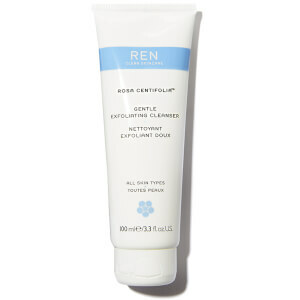 Designed to give your skin a thorough, effective but gentle cleanse, this Rosa Centifolia Gentle Exfoliating Cleanser by REN contains an innovative formula with micro beads of Jojoba to provide a gentle exfoliating action to remove dirt from your pores. Also containing a 100% natural Rose Extract Complex to tone, soften and soothe the skin, this cleanser is wonderfully refreshing and rejuvenating, and suitable for all skin types. K.D. Apply to damp face, gently massage, rinse off with warm water. Triglycerides from Jojoba Oil help add suppleness to the skin. Alpha Pinene from Juniper Oil and Menthone from Peppermint Oil, uplift and detox the skin. A little goes a long way and whilst it is gentle, it does have enough bite to do the job of exfoliating properly. Otherwise , it has a nice minty cool scent and feels very light on the skin. A great facial exfoliator thats sets up your skin very nicely for moisturising.